Baby orca, Pacific Northwest: Fourth young killer whale spotted. 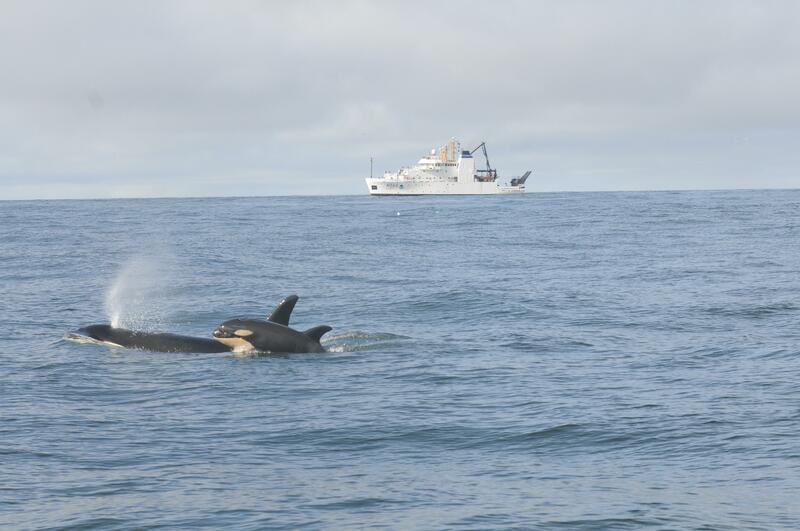 An orca calf and a female orca off the coast of Washington in late February. Another orca calf was sighted Monday. Ken Balcomb, a senior scientist with the Center for Whale Research on Friday Harbor, confirmed the birth to The Associated Press on Tuesday. The center keeps the official census of endangered southern resident killer whales for the federal government … While he and others hailed the birth of four baby orcas since December, they cautioned that the survival rate for babies is about 50 percent. “Given where we were four months ago, it’s certainly the trend we’re hoping for,” Brad Hanson, wildlife biologist with NOAA’s Northwest Fisheries Science Center in Seattle, said Tuesday. Indeed, Ken Balcomb. Relationships with one’s parents do take some time to sort out.